At times I feel like it is truly a blessing living here in Arizona. Those times are not usually when it’s 120 degrees outside, but it sure beats the below-zero temps the people back home are experiencing in Alaska! One of those other times is when my amazing neighbor drops off two big bags containing oranges and lemons from her backyard. What a blessing to live someplace where fruit trees thrive! 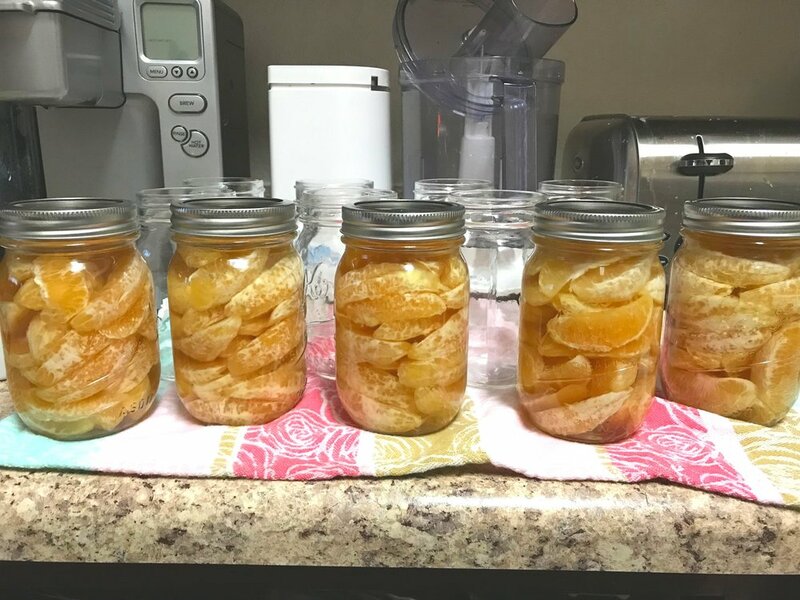 I wanted to do something different with them besides juice and/or freeze them, so I began looking for different ideas online and settled on one of my favorite activities, canning! Now, for someone not recovering from being struck by a car, this would be a pretty easy process to undertake. But for me, who knew peeling and processing eleven oranges would be so darn difficult??? The canning process is really just three steps: 1) Peel the citrus 2) Make the syrup and pour it over the fruit and 3) hot water can them. That’s it! They can be enjoyed alone as a sweet, preservative-free snack (think: those little plastic cups of mandarin orange slices-great for school/work lunches), they can be added to smoothies or oatmeal, to top pancakes or waffles, as stuffing for crepes…so many options! Read on below for the simple instructions. Combine sugar with 5.5 cups of water and bring to a boil, stirring to help the sugar dissolve. Simmer syrup mixture until all the sugar has dissolved. Keep it warm until you’re ready to fill your jars. Peel your citrus fruit-try to remove as much of the white parts as possible, then separate the slices. Pack the jars tightly with the slices, but don’t squish them to the point of bursting or breaking them. Leave at least one inch of head space in the jars. Fill jars with the warm syrup, leaving about a half inch of head space. Clean the rim of the jar and add the lid. Tighten the lid as much as you can. Heat the water to just simmering before adding the jars. Add the jars of fruit to the canning pot and make sure that the water covers the jars by at least one inch. Remove jars, add more water and bring back to a simmer if necessary to make sure the water level is high enough. Leave the jars to simmer for fifteen minutes. Turn off the heat and allow the water to cool a little bit before carefully removing the jars. Place the jars on a heat-resistant surface to cool. You will know they have sealed when the lid is indented as opposed to being puffed up, and you will hear that famous “ping!” sound as they pop. After removing from the heat, do not touch the jars until they have sealed. Citrus peelers are usually pretty inexpensive and make peeling your citrus fruit much easier. Use a veggie peeler before peeling your fruit (to get peels with as little pith as possible), dry and save them for other uses. If your jars don’t seal for some reason you have two choices: 1) put them in the fridge for immediate use or 2) put on new lids and try re-canning them. I’ve also used this method with grapefruits and lemons! I just added a little more sugar to the syrup to make it a little sweeter since those fruits tend to be more sour than the oranges.